You do celebrate Wayzgoose, don’t you? Wazgoose was a holiday originally celebrated by printers. Master printers would hold a celebration for their journeymen and apprentices as the season turned from summer to fall. At times, the day included pranks inflicted on members of the print shop who had breached some norm, often not replacing letter blocks in their proper places. Yeah, that guy had it coming on Wayzgoose. Traditionally, printers celebrated Wayzgoose on August 24th though the reason for using that date is a source of some debate. Some say it was because August 24th is St. Bartholomew’s Day, and old St. Barty is the patron saint of printers and bookbinders. Others claim that August 24th was the date Gutenberg finished the first printing of the bible, but that August 24th was Gutenberg’s completion date lacks any historical evidence. The word itself was most likely derived from an English phonetic spelling of a dutch term. Early English printers were heavily influenced by the Dutch; many of them would have learned their craft from Dutch printers. 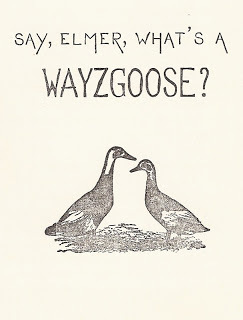 Today, the term ‘wayzgoose’ typically denotes celebrations relating to or held by those involved with printing, books, or bookmaking – whether it be printing societies or bookstores or schools or museums or municipalities – and is not linked to any particular date.